From the real source of religion to the infinite reach of rock ‘n’ roll; from the puzzle of the human ‘I’ to the true meaning of money, John Waters speaks and writes about his exhilarating, totally original reflections on the meaning of life in the modern world. Having started his career in 1981 with the Irish Music journal Hot Press, John Waters later wrote in The Irish Times from 1990 to 2014. His first book, Jiving at the Crossroads (1991), about the cultural underbelly of Irish politics at the height of the Haughey era, became a massive best-seller. 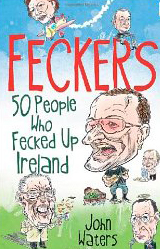 He went on to write and publish eight other books, including An Intelligent Person’s Guide to Modern Ireland (Duckworth, 1997) and Was it for this? Why Ireland lost the plot (Transworld Ireland, 2012). He has written a number of plays for stage and radio and currently writes a fortnightly essay for the American magazine of religion in the public square, First Things. He is a Permanent Research Fellow at the Center for Ethics and Culture, University of Notre Dame, Indiana, USA. He has written plays for radio and the stage, including Long Black Coat, (1994), Holy Secrets, (1996), Easter Dues, (1997), and Adverse Possession (1998).